India has lots of sunshine, but not enough government investments to make it a hot solar market. At least not yet. It's not for a lack of political will. Last year, the government announced its first-ever solar energy subsidies for both grid-connected projects using solar panels as well as solar thermal technologies. The same ruling party that announced the feed-in tariff program has held on to the helm after an election in May, a result that bodes well for solar companies, said Gopalan Rajeswaran, chief technology officer at Moser Baer Photovoltaics in New Delhi. "The government returned to power with a clear mandate, and it's good for the solar policies," said Rajeswaran at the Photovolatics Summit in San Francisco this week. The feed-in tariff program, which requires utilities to buy solar power at premium prices, was a good start but a small one. It capped the installations at 10 megawatts per state and 5 megawatts per developer. The government is now considering a more ambitious plan to boost solar power production to 20 gigawatts by 2020, 100 gigawatts by 2030 and 200 gigawatts in generation capacity by 2050, according to The Hindu. The country installed only about 2 megawatts of installed, grid-connected solar power systems by March 2008, according to India's Ministry of New and Renewable Energy. The country is big enough to accommodate 600 gigawatts, the government has said. "The prize for us is to grow the Indian market," said Rajeswaran. Moser Baer's parent company is one the world's largest maker of CDs, DVDs and laser discs, and it started a solar business in 2005 that ships its panels mainly to Europe. India has roughly 10 solar panel makers, who all export a vast majority of their products, said Rajeswaran. Together these solar panel makers had 80 megawatts of solar panel production capacity in 2007, up from 65 megawatts in 2006 and 45 megawatts in 2005, he added. Moser Baer added 40 megawatts of amorphous silicon thin film panels over the last year (see Moser Bear Rolls Out Thin Film, Builds Power Plant). India is attracting developers of other solar technologies as well. Solar thermal power could play a role, though the 5-megawatt cap for each developer makes the market unattractive at this point. Solar thermal power plants promise deliver cheap power but only if they are built in much larger scale. 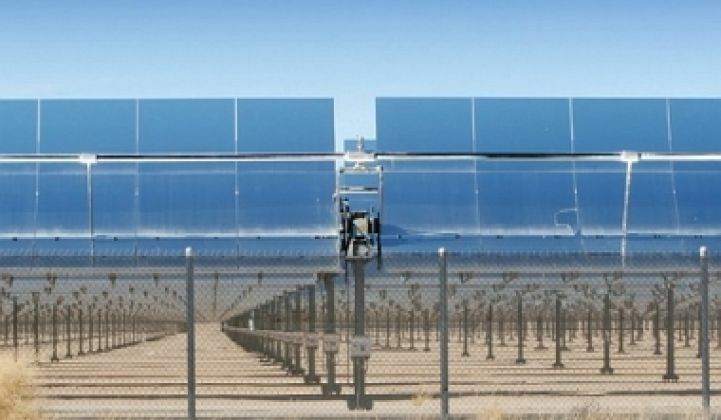 Arizona Public Service, the largest utility in the state, recently signed a power purchase agreement to buy solar thermal power from a 290-megawatt project. India "has such a small cap that it's not going to attract the initial investments," said Reese Tisdale, a research director at Energy Energy Research in Cambridge, Mass. Still, some Indian companies are prepping themselves for what they believe will be a large domestic market, Tisdale noted. Acme Group, for example, plans to start building a 100-megawatt solar thermal power project in India later this year. It has licensed the technology developed by Pasadena, Calif.-based eSolar for the project (see eSolar's Transformation Continues With Indian Deal).